This has been a long time coming, folks. Ever since I first met Baron Fig founders Joey and Adam in person, last year in April, they’ve been intensely interested in wooden pencils. We had a great chat, sitting on a park bench in Washington Square Park in NYC. 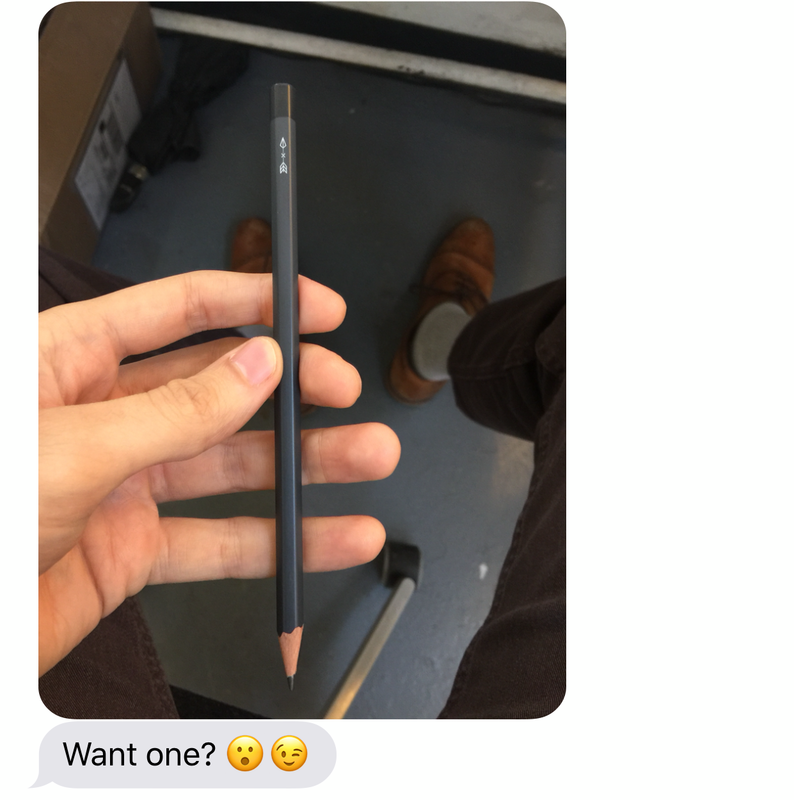 I told them what I thought made a good pencil, and they told me a bit about their design philosophy. And while I had nothing to do with the creation of this pencil, I do feel a bit of pride in it — I don’t know if I’ve ever followed someone’s process from ideation to creation before. 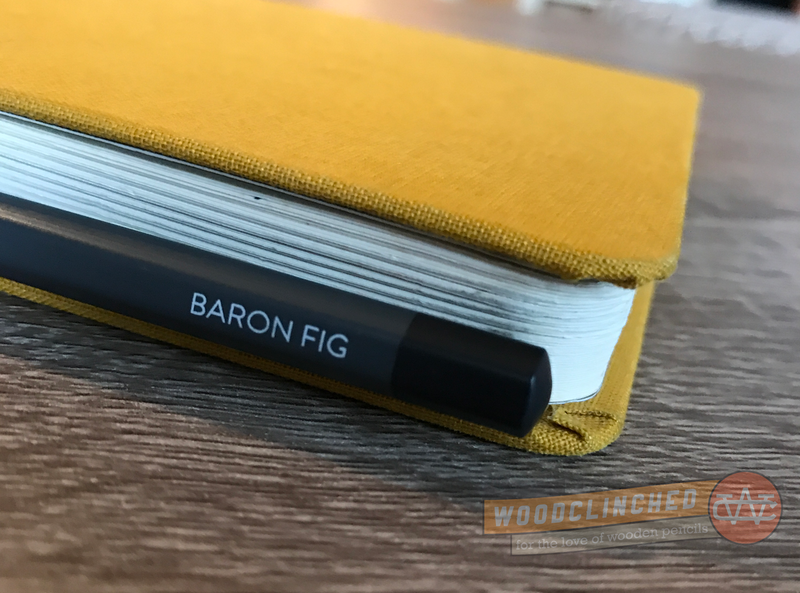 It’s unclear how the idea started — perhaps it was a whole bevy of Baron Fig users telling the guys how pencil-friendly their paper was: toothy but not rough; thick but not plush. Perhaps it was that pencils can express their design philosophy to a level that pens never can — ultimate simplicity expressed. No refills, no moving parts. Just wood, graphite and paint. But honestly, does it matter? I’m happy they decided to go for it. 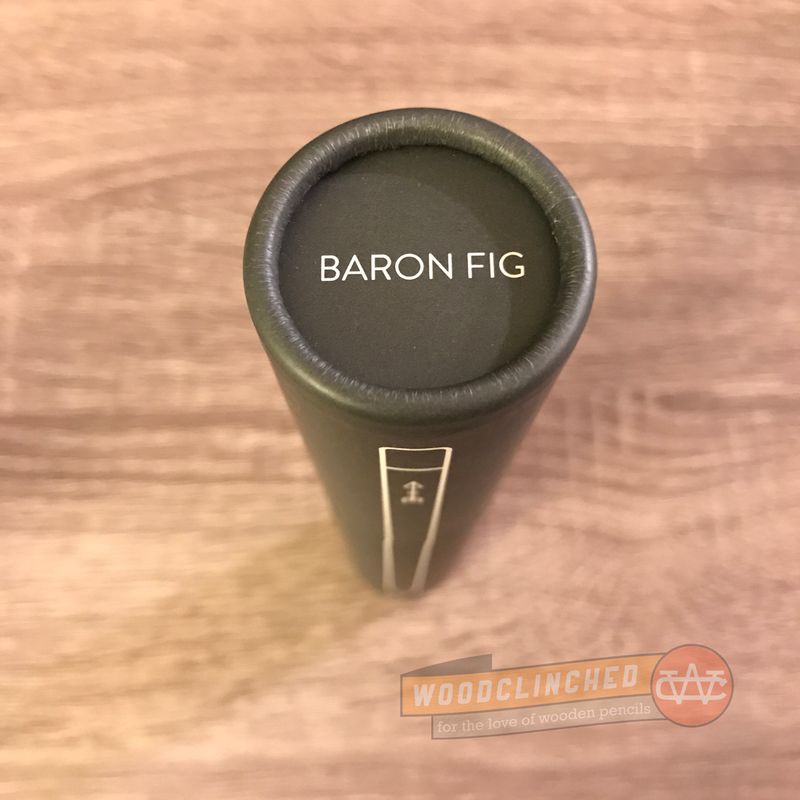 There’s a lot of (valid) criticism of the Baron Fig aesthetic out there: extreme minimalism, cold, clean lines, inexplicably feudal naming conventions. But for me, personally, I like it. I find warmth in their Confidant journals from the fabric covers, and though many of the designers I work with love the grey, I vastly prefer some color in my notebooks (I love, love my orange Three-Legged Juggler that I stashed away for a year or two before breaking open). Their product lines has explored notebooks just about as far as they could go. They have the Confidant, the Apprentice (their soft-covered pocket notebook) and the Vanguard (the larger, multi-sized soft-covered notebooks). They released a Confidant cover, the Guardian, and even a planner variant of the Confidant. Last year, they released the Squire, a pen that I wrote about here. It seemed only logical that a pencil would follow. 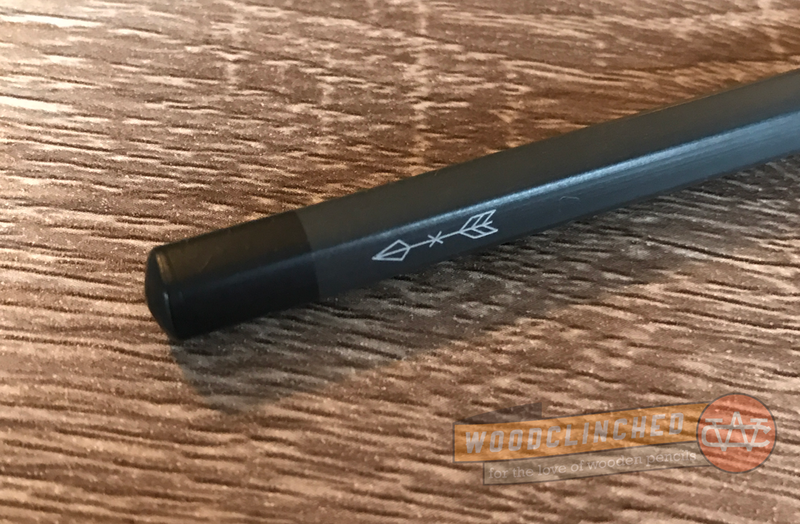 I was worried it might be a mechanical pencil version of the Squire, but I was happy to see they went with a woodcase pencil. 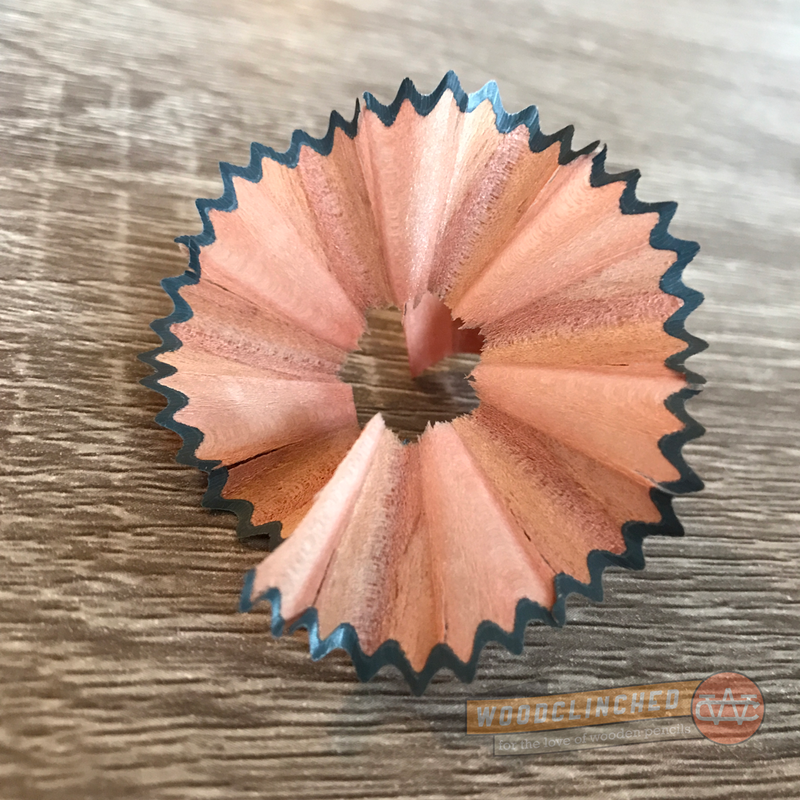 Let me walk through a few different aspects of this pencil that really stood out to me. From the moment I saw it, I knew it would be a perfect fit in their lineup. 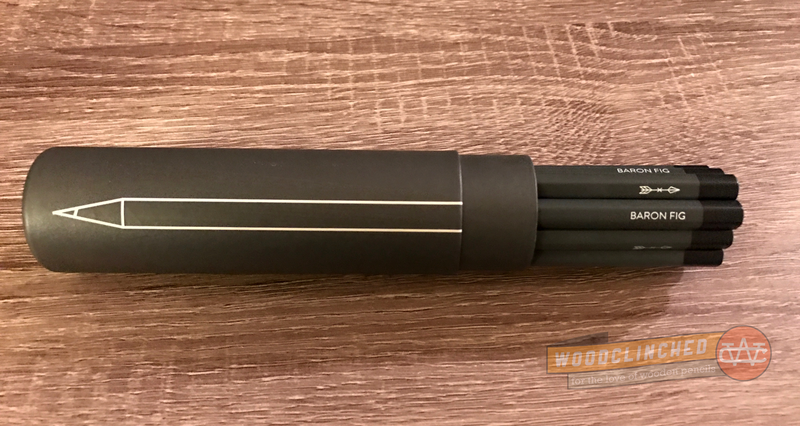 The grey barrel is finished with a really soft matte lacquer, that makes it fairly non-stick. Even with clammy hands, this shouldn’t slip from your fingers. Like the Squire before it, the insignia (icon?) on the barrel indicating the name is a simple line illustration. Instead of a sword, of course, there’s an arrow. Opposite it, “BARON FIG” is written. Both markings are, I believe, screenprinted on — there’s no sign it was debossed or stamped. Personally, I would have loved a little bit of color — maybe the yellow accent color they use for bookmarks in their Confidante, or the Baron Fig wine color on their boxes and branding. But I’m not too bent out of shape about it — I expected a monochromatic pencil, and I think the majority of their audience will prefer it. It’s definitely not going to turn any heads or start conversations, like a Blackwing or, say, a flashy Hi-Uni Penmanship. But that’s not what it’s for — this is designed to be a distraction-free workhorse. And while it’s fun to explain the story behind the Blackwing to strangers, it’s definitely a distraction. This is for focused sketching of wireframes, or writing important to-do lists, or just musing in your notebooks at breakfast to finish your Morning Pages. 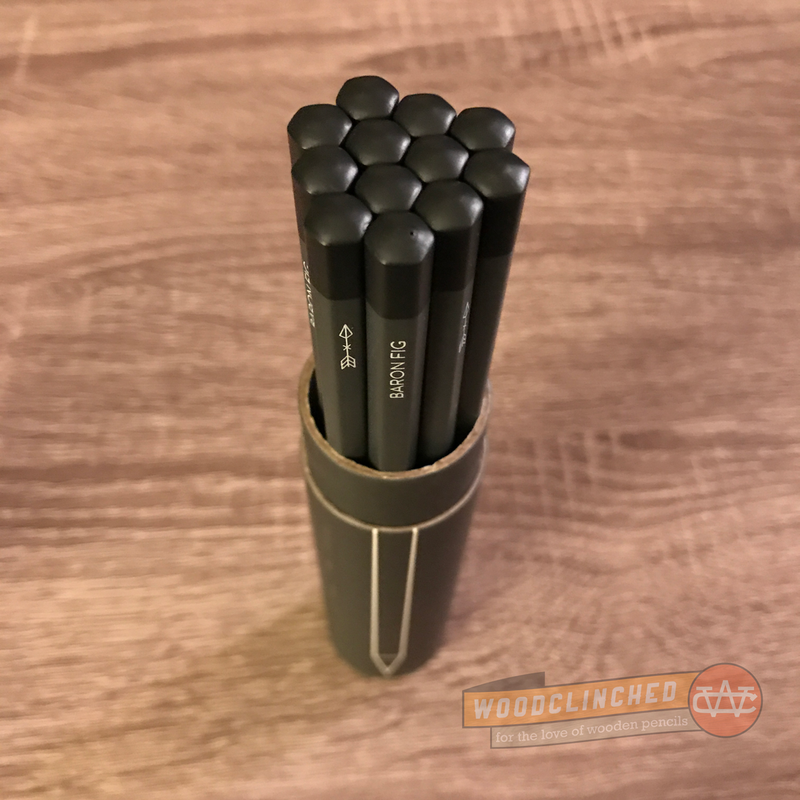 Johnny, Tim and I were lucky enough to get an advance dozen of the pencils a couple weeks before the launch so we could try them out and talk to them about it on the latest episode (check it out!). I used it almost exclusively for a week, and wrote all over — in my Confidante, my Field Notes, on cheap Post-it notes — you name it. When I sharpened it with my Kum Masterpiece, the wood looks blemish-free but still pretty woodgrainey. It doesn’t seem like they’re using a composite wood. I’m not sure what it is made of — I doubt it’s incense cedar because of how lightweight it is. Still, I’m a big fan. It smells like a wooden pencil. And it sharpens like a champ. The first thing I noticed was how incredibly lightweight it is. I don’t have a postage scale with me, but even considering there is no ferrule, it feels exceptionally light. So, at first, I thought it was going to feel cheap and scratchy. I was so pleased to be wrong. On every paper I used it on, the graphite was exceptionally well-balanced. It wasn’t buttery-smooth like a Blackwing (even the 602 is way smoother than others of its hardness), nor was it scratchy like its featherweight sibling, the extremely light and scratchy Faber-Castell Grip 2001. Baron Fig paper is widely considered to be pretty great for pencil, and this pencil is pretty great with this paper. I spent some considerable time writing with it in my Three-Legged Juggler Confidante, and it didn’t lay down the darkest mark in the world, but it barely smudged when I smeared it with my finger. And it erased very cleanly. I think that the packaging deserves its own category here. Baron Fig has always been obsessed with amazing packaging — Their Confidantes come in a perfectly engineered box. Unboxing it is an experience, much like an Apple product or other fine electronics. The Archers are no different. When I got the tube in the mail, I thought it was impossibly thin to fit. There was no way a dozen regular-sized pencils were going to fit in there! 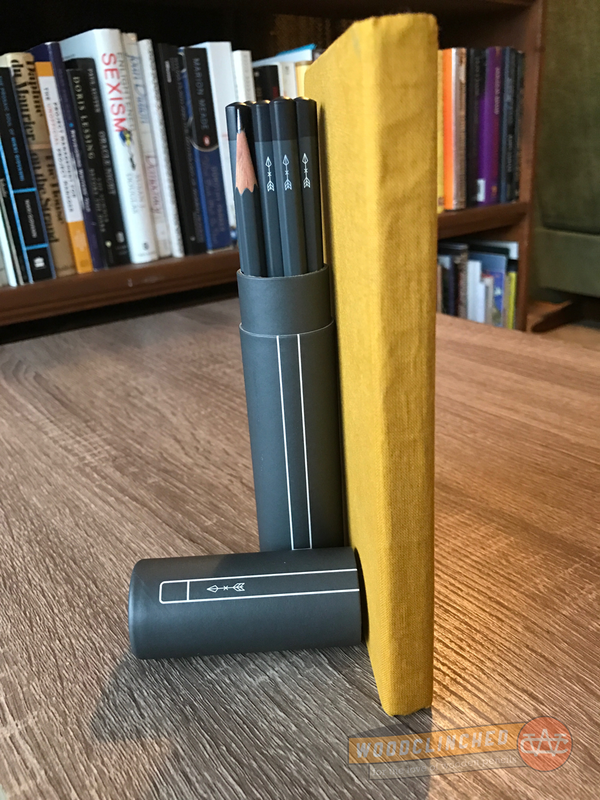 I showed the unopened tube to my wife, and asked her how many pencil she thought were in there, and her guess was around four to six pencils. Finally, I lifted the top of the tube off, and sure enough, 12 pencils were fit together in a 3x3x3 honeycomb triangle. When we were recording, I asked Joey and Adam how long it took to design that packaging — Adam admitted to doing a lot of math in order to make that happen. It certainly paid off. I’m a big fan of these little guys. I still prefer pencils with erasers on the end. 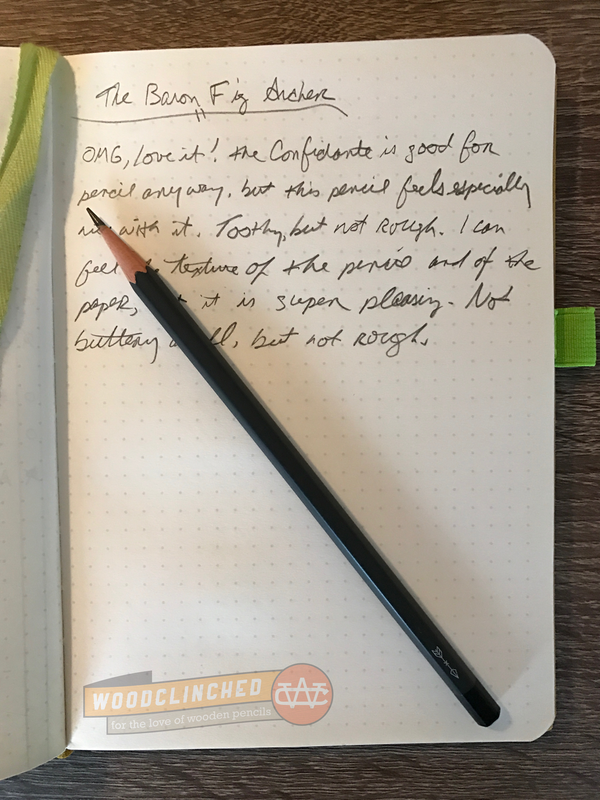 Blame it on my very American background — I maintain the eraser gives it a nice counterbalance when I’m writing, not to mention a super handy tool for when I need to rub out a mistake. But sometimes when I’m sketching or writing fast, I want a very lightweight pencil unencumbered by the extra weight a ferrule and eraser brings. These are sure to be a standard go-to for me. I think the price is perfect, too. It’s not cheap by any means, but at $15 a dozen, that means it’s $1.25 per pencil, which is quite a bit less than the $1.82 Blackwing. Like Apple, Baron Fig puts intentionality and design into everything they do. They strip out the cruft that’s worked its way into stationery and office supplies, leaving only the necessities. If that appeals to you, you’re going to love the Archer. Pick up a dozen or two over on their website for $15 a dozen. And thank you, Joey and Adam for this fantastic addition to your lineup, and for letting me feel like I was able to come along on the journey! Great review! I too, would have liked to have seen a touch of colour on them, but they look really sharp and elegant. I’ll definitely have to go pick up a dozen and try them out for myself. Is the tube stiff enough to stand up on its own with the pencils inside? It would be great if I got a pack for my desk and could have it standing by itself. Definitely! It’s very stiff. Very much like a Retro 51 pen box. I feel like the lead in these is actually kind of scratchy. I was disappointed when I sharpened one up and used it for the first time. I ordered the pencils online and had them at home for about a month before I finally used one. After writing the first word, on smooth Black n Red paper, I was crestfallen. 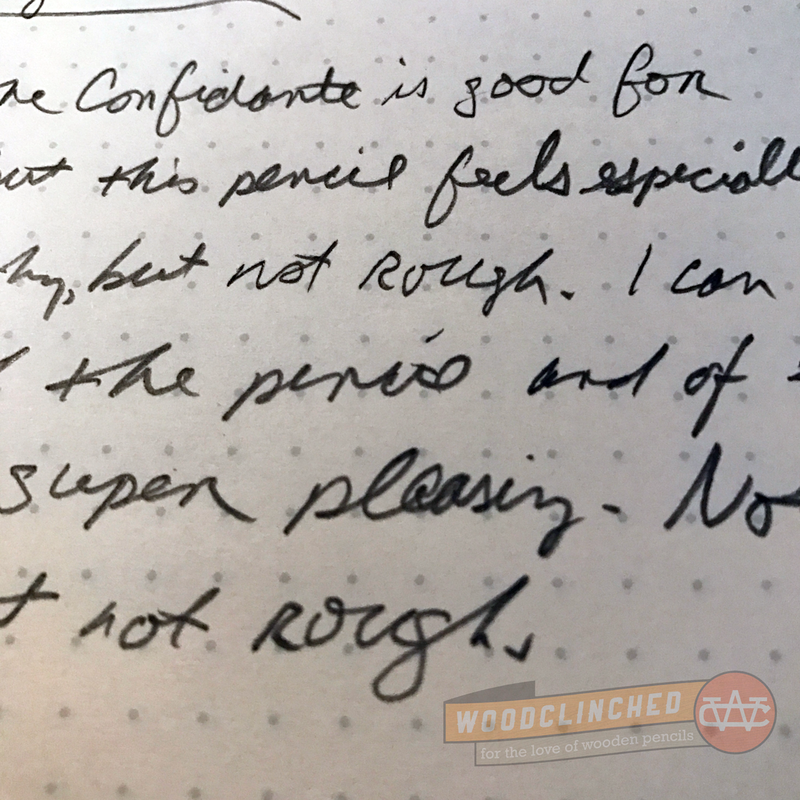 They aren’t bad, per se, but compared to harder pencils like a Faber Castell 9000 HB, or a Mongol “Fine Writing” 293 No 2, this pencil felt quite short of smooth. 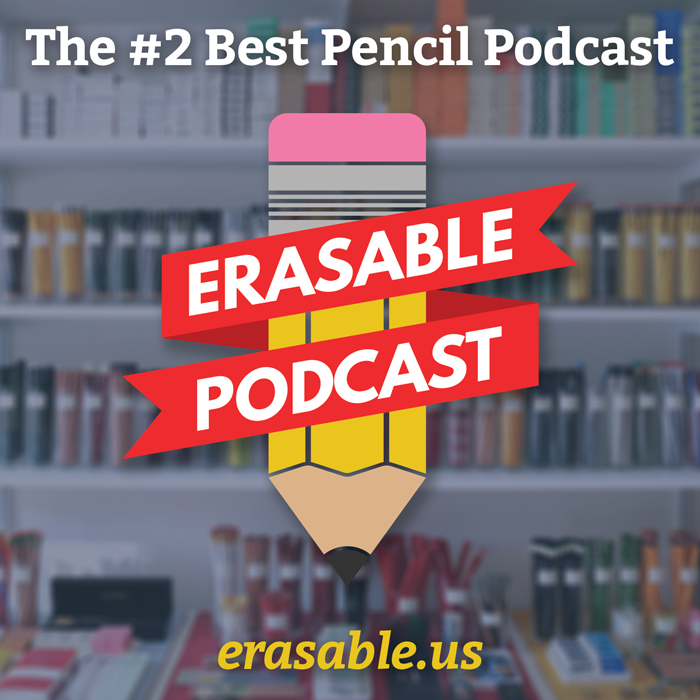 Andy is a co-host of The Erasable Podcast, a bi-weekly podcast by and for those who love wooden pencils. Subscribe on Apple Podcasts. Plumbago, issue 3 is almost here! "Woodclinched USA" header image by Darrell Edwards.